These steps are exactly what I needed for my Dad's '14 2500 Crew Cab 4x4 Big Horn. They extend down and out to a point that is actually helpful for getting in the truck. Installation is not difficult, but is complex. Wiring on the '13+ is a pain, but far from impossible. You will need a Right Angle drill (air preferred) for the minor drilling required, my DeWalt XRP 18V wouldn't fit between the frame and the body. Would certainly purchase again, give yourself a full day for install and you'll be VERY happy with the end product! 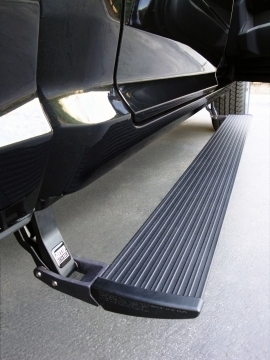 I put these step on my 2012 Ram 1500 and I couldn't be happier. They are well made and easy to install but plan on making a day out of it. Moe's Performance had the best price I could find and you can't beat the free shipping! Hats off to you guys!